The Late Child and Other Animals is a deeply moving graphic memoir of motherhood and childhood, of the horrors of World War II and the terrors of family court; of the bliss of country vacations and the fear of being stalked. It’s a gorgeously drawn and deeply personally written collaboration between Marguerite Van Cook and James Romberger, the New York artistic couple who produced the powerful 7 Miles a Second. The Late Child is a rich and intelligent work, one of the lushest and most giving graphic novels in recent memory. It would be easy to give The Late Child a conventional review by raving about the way that Romberger manipulates time during the World War II sequence to accentuate the intensely real surrealism of the events, or discuss the hallucinogenic scenes in family court in which Van Cook’s mother is cross-examined about her religious upbringing and parenting skills in order to be able to keep custody of her daughter. These are powerful scenes and I’ll touch on them later on in this essay. But Romberger has thrown down the gauntlet for the reviewer via an article published in the recent Study Group Comics 3D. 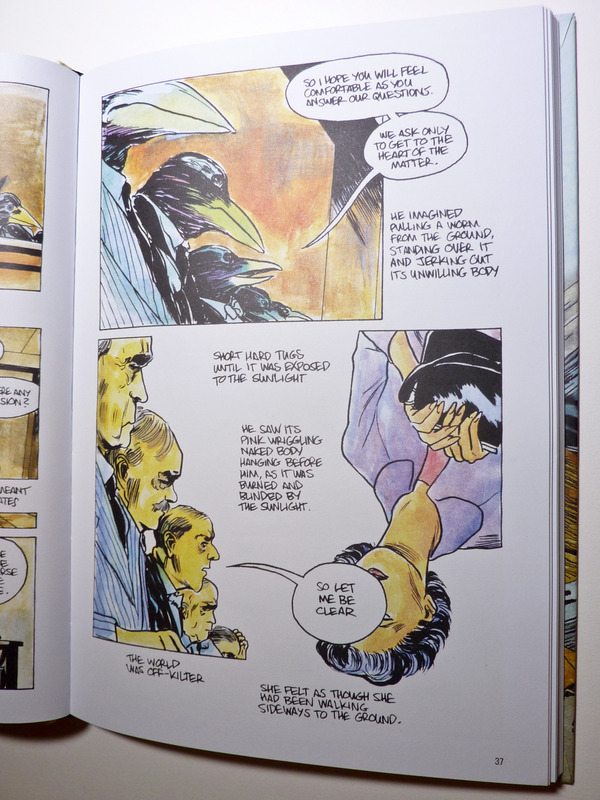 “In Reverse: William S. Burroughs and the Dark Shadows of Forensic Cartooning” is a thoughtful article that attempts to place biographical and autobiographical comics in some interesting contexts. I’ll address the qualities of work in The Late Child through the lens Romberger provides, under the logical assumption that many of his thoughts on this topic would be manifested in his comics work. All of the inset quotes are from him unless otherwise noted and the inline quotes are from the book. One path to uncovering the lost or hidden realities of one’s life can be navigated through mapping. Comics can have some of that quality of mapping, and the medium’s ability to render something explicitly can make memories tangible. We see the concept of mapping in a few places over these 200 pages. 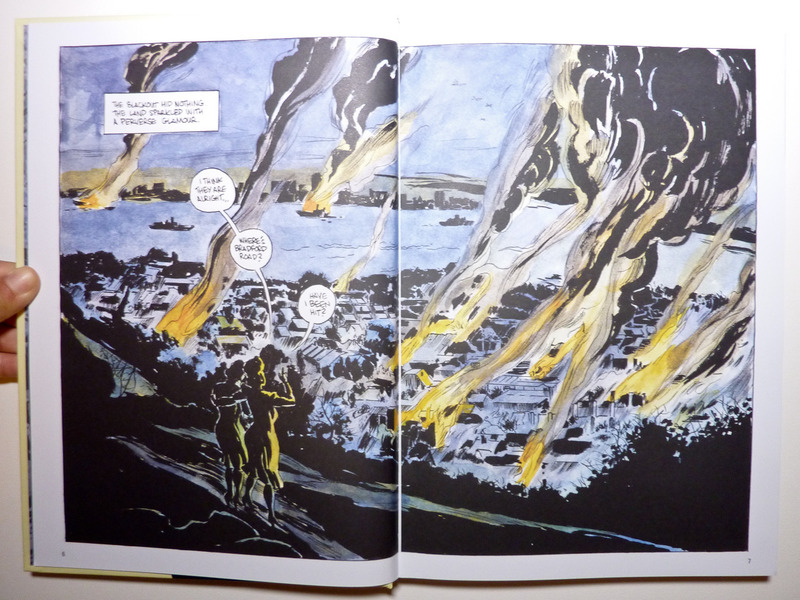 The first, very memorable, sequence follows Van Cook’s mother Hetty and aunt Daisy as they wander down from a hill after another evening of the Nazi bombings of her hometown Portsmouth. In that sequence there’s a clear sense that the creators tracked Van Cook’s mother’s specific pathway, determining exactly which streets she walked, where her family and friends lived, and how that area was damaged during the Blitz. These moments help to give this sequence a verisimilitude that somehow puts the reader right on the ground with the girl and her sister. It grounds the scene. It makes it real, and more than that, it gives the scene a subjective rather than objective reality. What we see isn’t the steadfast and anonymous London residents who are often shown in movies about the War; instead these are real Portsmouth residents reconstructed from memories or research or via imagination or whatever. By making the rainy, bombed-out streets feel real, by mapping the reader’s experience to the characters’ experience, we get a strong sense of the state of things as they really were – and if the creators then add touches of fiction around the edges, we know that the central, core truth of the work is intact. We have mapped their experiences, literally and metaphorically. We’re always aware that a book of this sort is a mix of personal memories, verifiable history and objective fact. We’re seeing the events of the times interpreted through the subjective experiences of Hetty and later on from Marguerite; Hetty’s reflection on the beauty of her husband’s paintings of flowers is as important as an anecdote about her waking up to a bomb crashing through her ceiling. When she adopts June, a two-year-old orphaned by the War, the attention of Hetty and the book turn more domestic – and sets the stage for the subjective/objective memory dichotomy in the next section. Just as autobiographical memory development cannot be adequately described as following a single, universal trajectory, so personal memories cannot be adequately described as occurring within a single level of mental representation or as involving a single mode of expression. The second story in The Late Child shows Hetty’s experience at a family court tribunal, a demeaning, horrible, depersonalizing experience in which she is forced to defend her lifestyle after she gave birth to Marguerite out of wedlock. It’s in this story that Van Cook and Romberger most effectively show the interior/exterior dichotomy of Hetty’s story as we watch the scene both on a symbolic and literal level. In order to prevent her daughters from being taken from her, Hetty is forced to go to the London Court. The building looks impressive from the outside “but the inside of the white marble building with its endless stairs and corridors appeared strangely dull.” Hetty has to navigate a depersonalized building to wait endlessly in a dull waiting room. She feels time stand still and the she feels for a moment she’s drowning – depicted symbolically as rising water that surrounds the room. Escorted into a long chamber and placed in a single chair many feet away from the arbiters of her fate, Hetty imagines her inquisitors as a row of crows, six strange cackling unknowable specters obscuring her life and determining her fate. As the painful interrogation plods relentlessly onward, the reader and protagonist are equally confused and estranged from the absurd and depersonalizing questions that are volleyed at her one after the next with dizzying speed. The narrators put us in the birds’ heads as we imagine Hetty as a worm that the crows are enjoying torturing and seeking out. The cross-examination feels depersonalizing and painful, but more than that, it works on a symbolic level because of the extrapolation of the actual into the metaphorical. We get a sense of Hetty’s state of mind and her pain as she is treated like a criminal, get a sense of her deep unease and her wandering thoughts as the members of the tribunal transform from crows to humans to masked humans and back again. This reflects the way that the thread of conversation ebbs and flows, and as the room closes in, Hetty like Alice with her pill, growing too large to be in the space and too small to walk away. 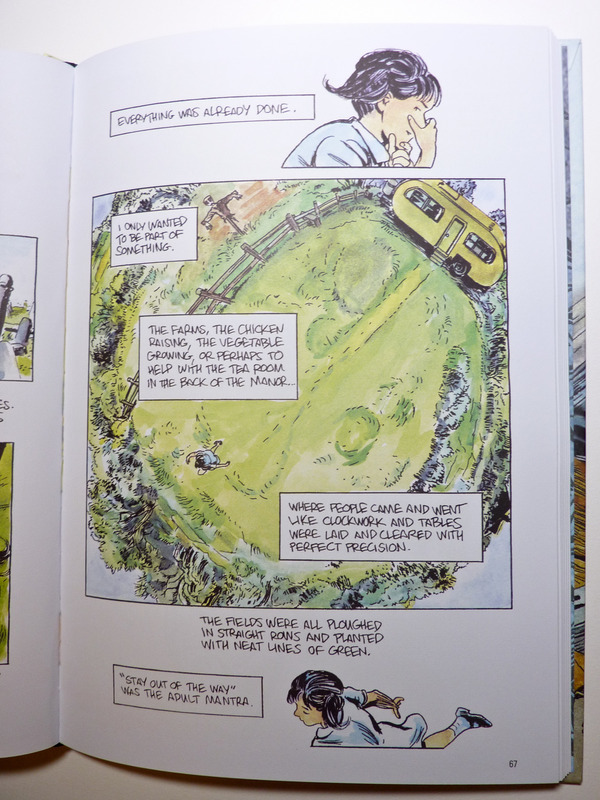 This imaginative approach to the courthouse segment of this graphic novel is an ideal illustration of the framework Chute uses to discuss memory. Rather than use a single mode of expression, Van Cook and Romberger use multiple shifting viewpoints in this segment, an ever-changing panoply of perspectives that gives allows us to both objectively and subjectively consume the lingering memory afterimage of the moment. It’s an artful way to capture both the dislocation of the moment as it happens and the subjective manner in which memory plays tricks on the perceptions of the past. There’s a Kafkaesque dreamlike feel to this segment that makes it especially powerful. 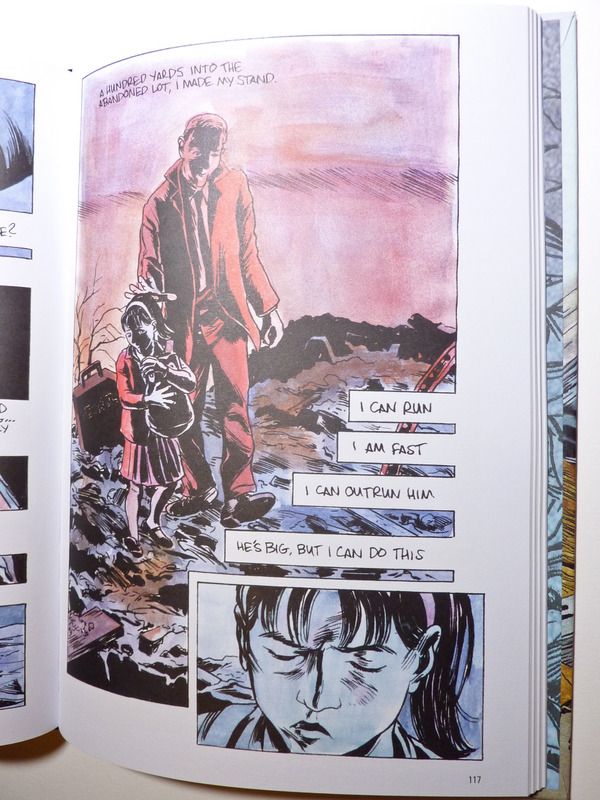 Objective reality and subjective perception are on display side by side, giving the reader a deeper insight into Hetty’s story than we could possibly get if we only saw either the interior or the exterior – a wonderful means of exploiting the potential of the comics medium. In many respects, the comic is a form of theatrical presentation but one that goes further than the temporal life of a performance, to allow the author to depict internal thought, as well as to externalize ideas and to voice the remembered dialogue of others. The third story in The Late Child shifts our focus from Hetty to young Marguerite and her adventures on her grandfather’s farm. We see existence through the eyes of a child, and the tumult of the previous chapters gives way to a delightful pastoral peace, a delightful landscape of happy gardens and quiet lawns where a little girl can wander without worry. This segment feels idyllic and happy (and also provides the explanation for the title) – but below the surface, the perceptive girl begins to feel a bit lost in this paradise, or perhaps feels a bit unneeded. Finally, bored as can be and desperate for an activity, Marguerite decides to clear out an old shed house – where she gets covered with dirty, a filthy ragamuffin – and worse, when her shovel hits a hedgehog, the sensitive girl feels a major trauma – “I’d struck the dear bristly creature” who may even have babies under the leaves. And though the girl recovers from the trauma, it’s one of the memories that Van Cook resurrects after many years for her memoir to retell. 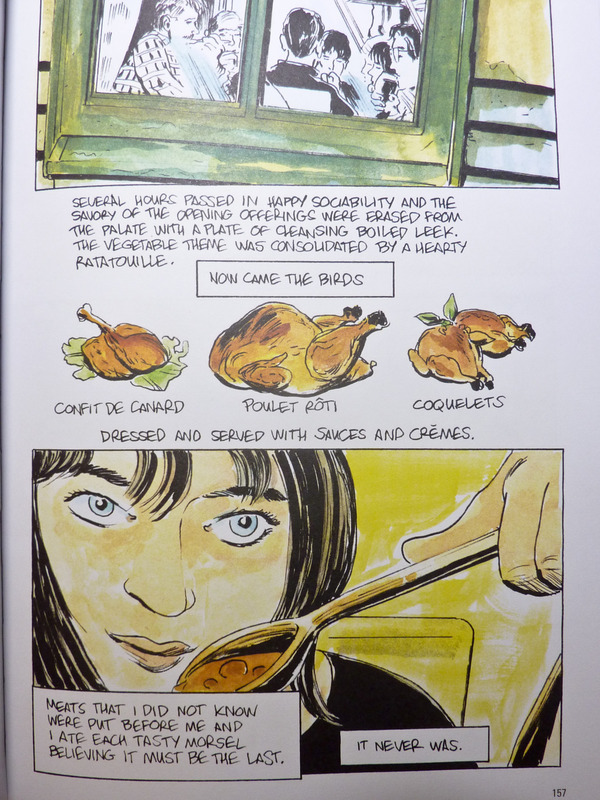 This middle segment of the story shows how the visual presentation of the countryside contrasts with Marguerite’s inner reverie. The art is a splash of lovely colors (Van Cook provides the empathetic coloring job on the book) and country life – fields and farmland, mice, birds and trees – which is surrounded by an adult’s memories of a child’s thoughts, the words surrounding the experience similar to how they surround the impressions in young Marguerite’s mind. She thinks “I never knew the world was so alive” as her senses consume all the natural beauty around her: “I was enthralled by this secret world and drawn ever up and out.” Nature gives and nature takes; the girl is humbled because she wanders too far, but like a tiny version of Icarus she has touched the divine. The text in conjunction with images allows for many associative connections to be presented, both subconsciously and consciously, and in ways that only textual production cannot. The fourth story here is also the most upsetting, the story of a terrifying encounter that eight-year-old “Maggot” (as Marguerite’s friend calls her) has with a strange man, shrouded in the shadows, who covets little girls. What makes this chapter work well is that it builds up with an approach that lulls the reader into comfort. Following on the previous chapter’s exploration of an idyllic summertime, with benign and comforting adults and a natural realm that imbues happiness on a happy chold, this section begins with two girls swimming, and as the text tells us, Prunella and Marguerite felt “they owned the world.” Childhood, after all, has moments of pure joy and hope, a paradise in the everyday, and even swimming in a rough ocean on a rainy day brings laughter and thrills. But as the creators move the readers along through this story, reality intrudes. Summer gives way to autumn, school and commitments begin, friends hug goodbye and wander to different schools and different friends, and the warming, peaceful rain yields to cold, bleak showers that are more oppressive, darker, and resonant of worry and loneliness and fear. Van Cook does something smart with the coloring as Romberger moves the reader through the chapter. This section starts with bright earthy colors that imply peace, but as the story edges towards its dark twist, the colors grow more spectral. The story gets darker and we meet a man who lives in the shadows. He’s a pederast, or something – the story isn’t explicit which is fine because the man isn’t explicit with himself, instead speaking in cryptic innuendo and bizarre, racing, circular thoughts that paint him as weird but also dangerous. So when this shadowy man places himself in the life of eight-year-old Marguerite, her head full of the nature stories of her schoolteacher as she meanders to the bus stop from her dance class on a cold, dark night, we feel fear for her. She’s a little girl lost in the contemplations in her head and as she walks the dusky streets, she seems swallowed by her surroundings. The perfect bait for our shadowy man. This chapter is eerily effective and the sort of thing that I can see really bothering many of us parents because the threat to this eight-year-old seems so real. The terrible reality of the scene is conveyed beautifully by the way that Van Cook and Romberger use parallel narrative to convey the story. We get young Marguerite’s inner monologue set next to the dark man’s thoughts, all placed in a noir mood in which it seems only bleakness can exist. We see the size of the man next to the child, feel her vulnerability through effective use of close-ups and half-shown faces, tilted angles, furtive glimpses and camera angles that emphasize the relative sizes of the two people. Because of the dark mood, we expect the worst and so does the little girl. Fear grows quickly. The drama builds and builds, too slowly and relentlessly to feel remotely comfortable, and when Marguerite finally takes action to escape her tormenter, drawn so much in the foreground of the panel that her face is partially cut off by the panel border, she seems a streak of red, dashing away in a desperate chase that pulls the reader in. As she starts to find safety, the colors shift again to purples and yellows and calming blues – Van Cook easing the reader out of the worry of the moment and reflecting her younger self’s escape from the stress. Things are alright, but Romberger chooses to have Hetty console Marguerite with the mother’s face hidden in shadow and silhouette, foreshadowing the sad climax of this moment in time, and foreshadowing the fractures that could divide mother and child in the future. As Van Cook reflects in her narration, “It was much more convenient when she was free of me, even for a few hours… not to have her own shame to bear.” Young Marguerite may have had a terrible trauma on this one particular day, but it seems that many days of her youthful years brought lesser traumas. Sequential form allows for both a slow considered reading and enables one to return to the top of the page and to flip back and forth to the pages before and after – to see the whole experience unified. This chapter fills the reader with joy and with a feeling of comradeship with Marguerite; I found myself lost in my own daydream on reading her reverie, thinking of favorite summer memories, lost friends, the beauty of nature, the joys of spending time in the sun. This final piece is peaceful and happy, without the expansive and sometimes surreal drama of previous chapters, but maybe that’s symbolic of the way of the life that Hetty and Marguerite live as their lives go on. Maybe the drama foreshadowed a few pages before has subsided. The mother’s life was forged in a gauntlet of fire. She saw her hometown nearly burned to the ground, lost her husband in the War (and apparently never remarried), suffered the trauma of fighting for custody and lived a life in the shadows. It was a difficult life, complicated by the compromised manner in which she saw her life and the need to always be striving to give her children a good life. As we get to know Marguerite, she’s a contemplative girl but one who can find peace and joy in her surroundings. Even in the story that contains terrible trauma for her – and illustrates her mother’s difficult relationship with her – she dwells on friends and sports and outdoor adventure. She’s risen above the worries of her mother and has begun her own journey to a much happier adulthood. The penultimate page of this book shows thirteen-year-old Marguerite swimming in the ocean. She’s diving down into the waves, a look of pure contentment on her face, nobody around her that we can see. She’s moved into her own space, become her own adult, and is ready to dive into the world of adulthood. She may have to battle some waves while she swims, but she has grown confidence in her abilities and knows how to fight them. She will emerge on a distant shore, a late child arrived right on schedule as her own person. Great review! I’m going to try finding a copy of this.